Don't worry...I'm soaking it all in for everyone! 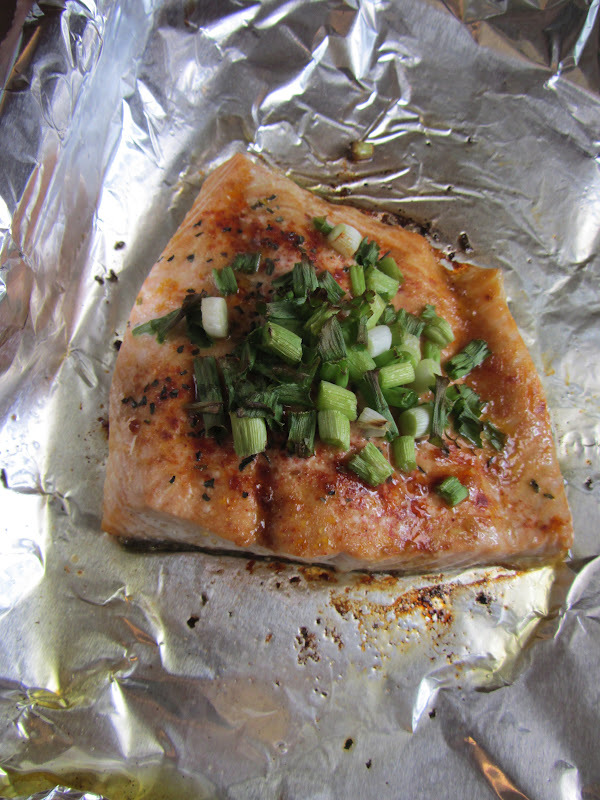 This week, I asked my mother-in-law if I could take pictures of her making her famous baked salmon. Yes, my mother-in-law comes over to cook for the family about 4 times a week, and yes, I'm a very lucky gal. She loves to cook and she lives for fattening up her grandchildren. But it wasn't always this way. 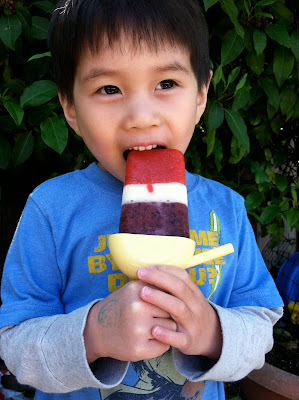 When we found out that Tristan had multiple food allergies about 7 years ago (gasp--he will be 8 in less than two weeks! ), all the caretakers, my mother-in-law included, was stumped at how to feed him. This was especially true during the three or four months while I was still breastfeeding when he and I were on an elimination diet, strictly avoiding the top 8 allergens. For over a month, he survived on halved grapes, Cheerios, Costco rotisserie chicken, & breastmilk. Over the years, my mother-in-law has successfully created lots of recipes that are not only allergy-friendly, but family-friendly too. This is one of our favorites, and we eat this at least three times a week, along with a few side dishes. Here comes a quick disclaimer for the photos and recipe that follows. Not only is she a good cook, my mother-in-law works fast. I thought I worked fast, priding myself at how I zip around doing three things at once. Oh, no. 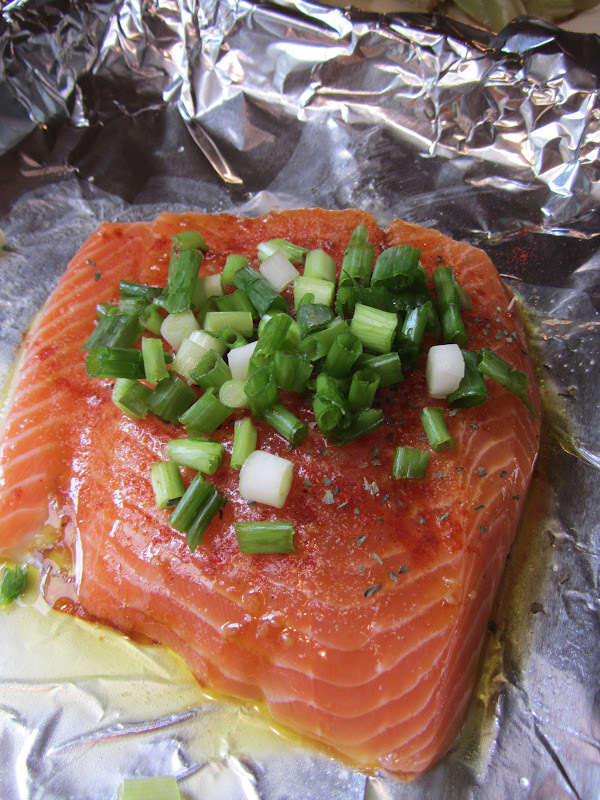 I could barely get the salmon inside the frame of the picture as she was prepping it. But I did my best. Next disclaimer...there are no measurements. If you could see how fast she works, you'd know there was scarcely time to measure anything. Just a little of this and a little of that. Which is great when you're in a hurry. Make it a few times and it'll be easy to adjust to taste. 1. Preheat oven to 375. Foil line a baking pan and rinse and dry salmon filet. Chop up a green onion. 2. Grease pan with olive oil, then rub a layer of olive oil onto both sides of the salmon. 3. Pour a bit of marinade (like Mr. Yoshida's Original Gourmet sauce) or Soyaki sauce (Trader Joe's) on top of the filet, and rub into both sides. A little goes a long way for these sauces. I believe both of these sauces contain soy and wheat, but I will check when I get back to reality. 4. Season additionally with garlic powder, basil, and smoked paprika. Add green onion for garnish if desired. 5. Skin side down, bake for about 10 minutes (adjust for thickness). Because it is baking uncovered, you should get a nice crispiness on top. If you like it crispier, try cooking at 400. OK, the vineyards are calling. Enjoy your week everyone! Looks like my boys found love in a cone! There's nothing like bowls and cones filled with ice cream on hot summer days. And boy, have we been having lots of them -- ice cream and hot days. These summer days can get kind of long for me with the kids out of school (and into each other's hair!) and the relentless sunlight bearing down on us. I've found myself daydreaming more often about tropical beaches of Hawaii, Thailand, and Mexico, places I was lucky enough to visit before kids and food allergies became huge factors in our travel considerations. While it would feel too risky and stressful to me to travel abroad, there's no reason I can't bring a bit of the tropics to our house. The temperatures are already in the 90s so why not just add some fruity flavors to satisfy my beachy wishes? And thus, mango ice cream quickly ascended the "Recipes To Try" list. Besides being high vitamin A and C content, mango is a great ice cream flavor because it goes well with coconut milk. (All that tropical goodness!) I myself used one can of full-fat coconut milk and 2 1/2 cups of flax milk when I made this. This almost overflowed my 2-quart maker so I reduced the flax milk to 2 cups in the recipe that follows. I also reduced the amount of sugar that the original recipe called for. Apparently, fat and sugar are two very important agents in preventing the formation of ice crystals in ice cream. Arrowroot can be helpful in creating a smoother texture, too. Despite the arrowroot, the ice cream did get a little icy after freezing it overnight. Truthfully, I am okay with some compromise in texture if it means reducing the fat and calories! If the texture is of utmost importance and you aren't too worried about your waistline, use all full-fat coconut milk for the creamiest results. to three was a big improvement on the mango taste. Mix about1/2 cup of the coconut milk with the arrowroot powder until powder is dissolved. Set aside. In a medium saucepan, heat up remaining coconut milk, mango puree, the 2 cups of additional milk substitute, lime juice, and sugar over medium heat. Taste for sweetness and add more sugar if necessary. Stir occasionally as the mixture cooks. When the mixture begins to boil, stir in the coconut milk/arrowroot powder slurry. Reduce heat to low and cook for a couple more minutes, stirring constantly as the mixture thickens. Cool mixture completely. It should thicken more as it cools. Once the mixture is completely cooled, refrigerate for at least several hours. Then follow the directions of your ice cream maker or, for those without an ice cream maker, simply freeze the mixture! Three options for serving: (1) For a soft-serve texture, scoop and eat immediately after making it in your ice cream maker; (2) Freeze for 1 hour after making it, then serve. (This is my favorite texture! ); or (3) Freeze until you need it. Before serving, allow the ice cream to sit at room temperature for 15-20 minutes to soften for ease of scoopability. On October 13, San Jose will host the 2012 FAAN BJ Hom Memorial Walk in Lake Cunningham Park. The event is one of many fundraising walks by the Food Allergy & Anaphylaxis Network to raise awareness, provide advocacy and education, and advance research for those impacted by food allergies and anaphylaxis. 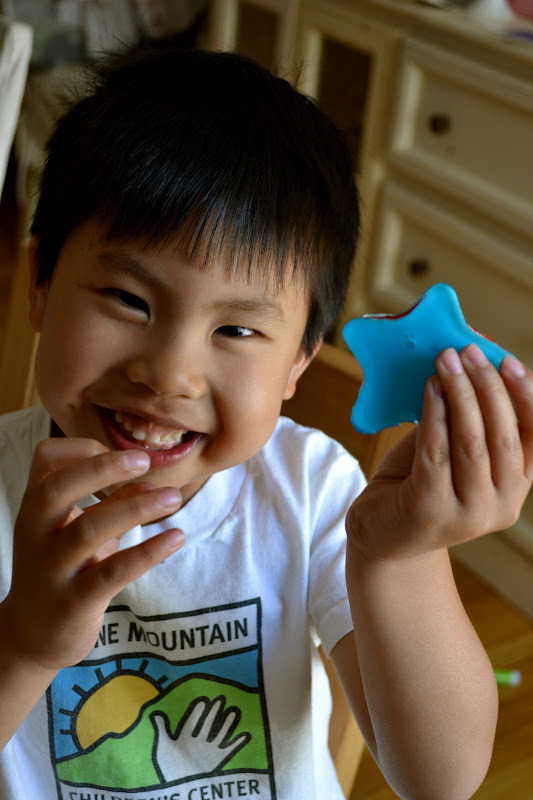 Bay Area residents Brian and Kathy Hom had been aware of his son BJ's allergies and sensitivities to certain foods. Hives and itchy throat were symptoms that BJ had previously experienced after eating peanut butter and certain fish. His family practiced avoidance of these foods and had successfully managed his previous reactions with antihistamines. (BJ never had his food allergies professionally evaluated so he did not have an Epi-Pen prescription, a fact that his father Brian painfully regrets.) In 2008 the Homs took a vacation in Mexico to celebrate BJ's high school graduation and 18th birthday. On their first night there BJ suffered a reaction after eating a buffet dinner. Within minutes of complaining to his dad about a sore throat, BJ collapsed. He died of anaphylaxis to peanuts, an ingredient of one of the buffet desserts. The BJ Hom Memorial Walk will bring friends, families, and community members together to support the fight against food allergies and anaphylaxis. We have lost too many children and young adults to food-related anaphylaxis. In the last 12 months alone, food allergies have taken Ammaria Johnson (age 7), Jharell Dillard (age 15) , Diallo Robbins-Brinson (age 15), and Tyler Cody Davis (age 20) all too soon. As a mother of two kids with multiple food allergies, these tragic deaths break my heart but also instill a deep fear within. These kids could easily have been mine. I need to do everything I can to protect my food-allergic kids and other kids like them. I walk for my precious boys. Who will you walk for? By raising money and awareness, FAAN and its supporters aspire to move closer to a world that is safer for all people who are affected by food allergies. Be a part of the cure and register today for the FAAN walk nearest you. If you are in the Bay Area, please consider joining Get Allergy Wise's team or forming your own. Kids, strollers, and baby carriers are welcome! Save the date for the FAANadix Car and Motorcycle Fundraiser Show for Food Allergies! The event takes place on Saturday, July 28, at Evergreen Valley High School in San Jose. Attractions include live entertainment, gourmet food trucks, raffles, and vendor booths. This is a free viewing for the public. Participating owners pay a donation fee to show their vehicles. Come support the event! These kids so need a vacation after their vacation. Here in our house we just finished two weeks of nonstop activity with visiting family. We have loved every bit of the food, conversations, and adventures with our 20 East Coast relatives whom we see every year or two. We did a bit of traveling together and a whole lot of eating and <sigh of relief> the kids fared well despite several meals out (we mostly packed our own food) and plenty of cooks in the shared kitchen. My husband and I have been grateful for the lengths that our extended family has gone to accommodate the kids milk, peanut, and various tree nut allergies. They get it. It's been magical! We shared a huge rental house for a few days in South Lake Tahoe after my brother-in-law's wedding. With a group of about 25 people and many who love to cook, we all helped out with various meals throughout the week. I've come to realize that prepping in the kitchen and feeding the masses is now relaxing and therapeutic for me. In my younger years when I was less experienced and less confident, cooking for other people was really stressful. Our pantry at home has been getting cluttered so I vowed to use up as many of our stockpiled goods as possible on this trip, a task I jokingly referred to as my personal "Iron Chef" challenge. For one dinner, I made some vegan tacos and nachos with Daiya Vegan Shreds, Trader Joe's shells, beefless ground beef and dairy-free taco seasoning, and canned beans. Box of shells and 5 cans of beans used -- YES! And for one of the lunches, I freed up a lot of space in the pantry with a curried pumpkin (2 cans of pumpkin, vegetable broth, and 2 cans of coconut milk). It was my first time making the pumpkin soup. With just a couple of simple substitutions and the addition of minced ginger, it became a more allergy-friendly, delicious meal. If you aren't a fan of ginger, start out with just 1 teaspoon of fresh ginger and add more to taste. You can completely omit the ginger, too, but I really do think it adds great flavor to the soup. Curry powder is actually a mix of spices that may include coriander, turmeric, cumin, fenugreek, cinnamon, red pepper, cardamom, turmeric, cloves, mustard, and ginger. If you know of or suspect any spice allergies, it's best to avoid pre-mixed curry and make your own safe curry mix. There are variations here. Heat cooking oil in pot over medium heat. Add onions. Stir and cook for a couple of minutes. Then add mushrooms. Saute onions and mushrooms until onions become translucent. Next, add thickening agent (cornstarch, flour, or arrowroot), curry powder to the pot. Mix constantly until both are completely dissolved. Add broth. Bring to a boil, stirring often to thicken the soup. Add in pumpkin, coconut milk, syrup/sugar/sweetener, ginger, and nutmeg. Stir thoroughly to break up any pumpkin chunks. Simmer on low for 20 minutes stirring occasionally. I doubled the recipe and served it as a part of lunch (pineapple curry fried rice plus soup) for 15 people. The soup was a big winner among the family. I was thrilled by how easy this soup was to make and how smooth and fragrant it was despite a fairly short list of ingredients. With Trader Joe's canned organic pumpkin making its way back onto shelves in the fall, this will definitely make it on to my holiday season meals list! "I just can't stop eating this salad!" my seven-year-old exclaimed tonight at dinner. I have waited so long to hear those words. My kids eating and loving salad--I wasn't sure I'd see the day. I thought, they'd never eat raw veggies, in a salad, no less. I had made so many textbook mistakes along the way: introducing fruit based-baby food before veggies, serving exclusively cooked veggies instead of raw ones, giving up on finding tasty salad dressings and dips free of nuts, eggs, and dairy for my food allergic children. Their newfound love for salad comes in the midst of what seems like a constant barrage of new findings that have induced severe pangs of guilt among parents of small children everywhere (particularly FA moms), such as the connection between triclosan in antibacterial soaps contributing to food allergies, the detriments of feeding soy to young children, the hazards of buying produce that isn't organically grown...the list goes on and on. And although most of these studies may still be in research stages, there are varying degrees of merit to each of them. You start checking dangerous foods off your list, minus the food allergies, and what are we left with? Before we declare defeat, we remember that a balanced diet is what it says it is--a balance, or a variety of foods, to maintain a healthful diet. No matter how they may alter the food pyramid into something virtually unrecognizable (it's now a plate, by the way), fruits and veggies remain at the top of the list. And that is why I am so grateful for salad. It is very possible that salad will remain a staple in the diet of my food allergic children, as adolescents, teens, college students (one can hope), and adults. And that would be great, because they're easy to make, easy to tailor to one's tastes and food restrictions, and always in season. 1. Perseverance and patience. As skeptical (and I was the biggest skeptic of all) as you might be, try try and try again. You do this when you're introducing food to an infant, you just get a little less optimistic and headstrong as they become picky toddlers. My mom has almost always served a green salad as a side for Sunday night dinners, and after weeks and weeks (and weeks!) of refusing salad, they now ask for salad on a regular basis. It started with one tomato, then a few, then many, then a piece of lettuce to go with the tomatoes, and so on. 2. Stick with the familiar, at first. Create first salads using a few well-loved ingredients, and cook or par-cook or grill some of the veggies if they're accustomed to them that way. Slowly introduce favorite cooked veggies raw, and new veggies and other ingredients that may be less familiar. When introducing a new ingredient, place in on the side in a bowl so kids have the option to taste test it before adding it to their salad, and can control its portion before adding it to their plates. Healthful salads can be customized to accommodate food allergies and picky eaters. 3. Let the children lend a hand. Start at the farmer's market or supermarket by allowing children to pick a few ingredients, preferably fresh fruits or veggies, to add to their salad. Teach them to prepare the ingredients--wash, peel, cut, etc., as age appropriate. The lettuce dryers and salad tossing are always a big hit. 4. Create a salad bar. Give each ingredient its own bowl or plate and allow the whole family to personalize their salads. Because of cross contamination often found in restaurant salad bars, this could be a unique opportunity for our food allergic children. 5. Have an assortment of allergy-safe dressings for your children to choose from. The children hosted a salad dressing pop poll tonight at the dinner table, and were tickled to see which dressing each family member liked and disliked. I especially like a few of the Brianna's Homestyle Dressings, like their Rich Poppy Seed and Saucy Ginger Mandarin. For you DIY types, pick up a salad dressing bottle with recipe measurements inscribed on the outside--like the Kolder Salad Dressing Bottle--making shaking, serving, storing, and clean-up a breeze. 6. Start with the more kid-friendly leafy greens. Baby spinach, butter lettuce, and romaine lettuce are all good choices--they've got good crunch, but are easy to chew and on the sweeter end of the spectrum. 7. Keep a few more "exotic" ingredients on hand for salad nights. I add tortilla strips and bacon bits to salads to help entice little ones. Irene added quinoa, edamame, dried cranberries, and pumpkin seeds to her Greens and Quinoa Salad. Think pomegranate seeds, bosc pears, sliced strawberries, artichoke hearts, olives, and heirloom tomatoes. You'll be surprised what your kids gravitate to, and they'll be even more surprised! Add salad nights to your weekly dinner repertoire! Enjoy! I remember the first time I was introduced to lemon squares. My classmate and good friend, Amanda, with whom I rode the school bus would have these treats in her lunchbox every so often. Her mother would wrap these homemade desserts in tin foil. Watching Amanda open them was like watching someone open a present. The homemade lemon squares were precious, delicious pieces of love that I was lucky to get a taste of! A mom from Callan's preschool made lemon cookies for a school function. They were such a big hit that she shared the recipe with the whole community. I had not tried them but when I followed the link (to the recipe from the blog Sophistimom) and saw the picture of the powdery white treats, fond memories of Amanda's lemon squares immediately came to mind. Curious, I checked over the recipe's ingredient list and was pleasantly surprised that, unlike lemon squares or bars, no eggs were needed for these cookies. I knew then in no uncertain terms that I had to try these! The recipe did patiently sit on my iPhone for a couple busy, busy months before I finally had time to make them. But make them I did, for Ryken's birthday party, with a couple of substitutions to make their milk-free and add a little fiber. The end results were so delicious and easy to make, I made them for a dessert buffet at my brother-in-law's wedding. didn't work as well as dusting the finished cookies with the sugar. Preheat oven to 325 degrees Fahrenheit. 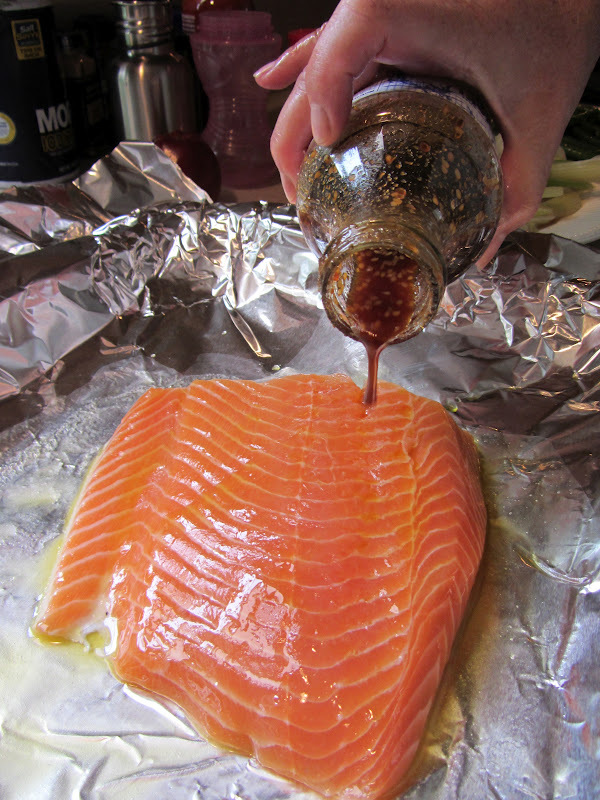 Grease or line a large cookie sheet with foil or parchment paper. Cream margarine and sugar together in a medium bowl. Add agave nectar and combine well. In a separate bowl, combine flour, salt, and lemon zest. Stir in flour mixture to margarine mixture until the dough is fairly combined. Some lumps are fine. In a small bowl, add baking soda to the lemon juice. The combination will instantly fizz and bubble. Stir quickly to dissolve baking soda. Immediately add the lemon juice mixture to the dough and mix or knead until well combined. Hand-roll the dough into 1-inch or 1.5-inch balls. They will flatten out on their own during the baking process. Do space them about 2 inches apart so they have room to spread. Bake at 325 degrees for 8-10 minutes or until the bottoms of the cookies are just beginning to turn golden. (I took mine out between 8-9 minutes.) They may appear a little soft and pale but they definitely will continue to cook a little on the pan while they are cooling off and achieve a more golden color. So important not to overbake! Cool the cookies on its pan. Then dust or sprinkle cookies with powdered sugar. Store cookies in an airtight container in a cool place. Here's hoping that these cookies bring back some fond childhood memories for you. If you are new to lemony baked treats, bake these and make some new memories with your loved ones! Kyle Dine is Coming to the Bay Area! 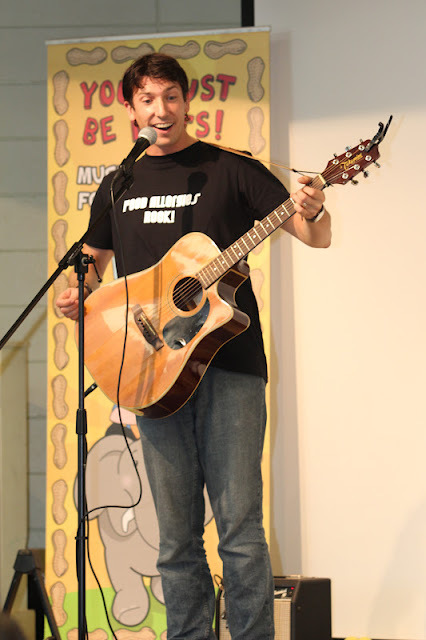 Kyle Dine--everyone's favorite food allergy singer, talented musician, and super nice guy--will be coming to California this fall and wants to play at your child's school! We can hardly believe he still has dates open for school performances in the Bay Area--September 27th and 28th, and October 4th and 5th. If you are interested, please please please contact him ASAP for more information about fees and schedules. To hear a sample of Kyle's music, visit his website. 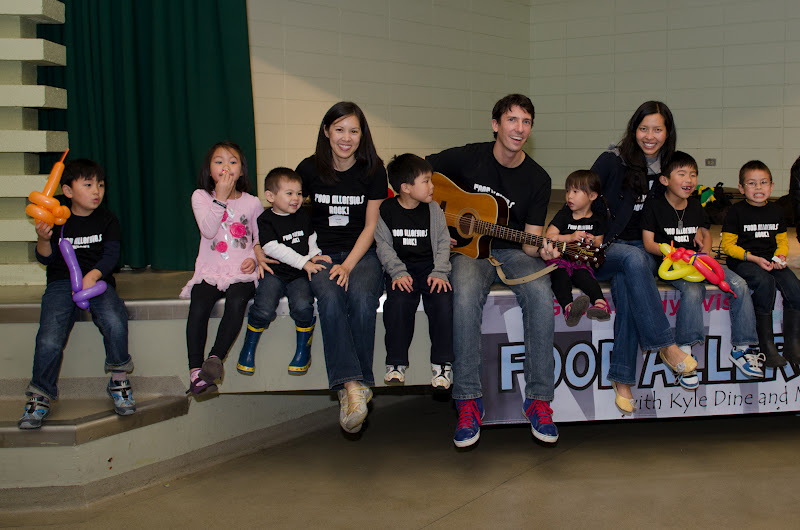 Last year, we were really fortunate to feature Kyle at his premiere Bay Area performance at Get Allergy Wise's Food Allergies Rock event. He mingled with guests, sampled our vendors' allergy-safe treats, and rocked the house in Golden Gate Park. Both parents and children found an instant connection with Kyle, a passionate advocate for food allergy awareness, and were touched by his tunes. Contact Kyle directly to set up your school assembly and prepare yourself for a unique opportunity and incredible gift for your children and their school communities...and keep on spreading allergy awareness! Fourth of July. A day for family, picnics, hotdogs, and all things red, white, and blue. And what better way to celebrate than to make one of America's favorite desserts: Jell-O. Who could forget a tray of Jell-O chilling in the fridge on a hot day, pudding pop commercials featuring Bill Cosby, or the coveted rainbow layered Jell-O served at parties? Such a mystery to my little hands, how they got all those colors to line up so perfectly in one little square of Jell-O. And what was the white layer made of? Well, Jenn at JustJenn Recipes seems to understand my childhood obsession, with a beautiful tutorial on how to make rainbow Jell-O. 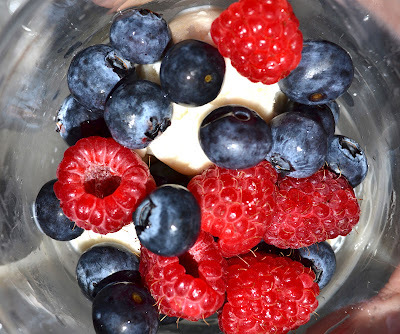 I decided to try my hand at making a dairy-free version for the Fourth of July, using coconut milk instead of condensed milk. Add color and stripes to your Fourth of July party with Red, White, & Blue Jell-O. 1. Combine 1 cup of coconut milk with 1 cup of hot water and set aside. If you prefer a sweeter white layer, you could probably add some sugar to this mixture. 2. Stir in 2 envelopes of unflavored Knox gelatin with 1 cup of hot water, then combine with coconut milk mixture and let cool to room temperature. 3. Mix together box of red Jell-O, 1 envelope of Knox gelatin, and 1-1/2 cups of hot water. Pour about half the mixture into 9 x 13 Pyrex pan and let chill in the refrigerator until set, about 30 minutes. If you are worried about sticking, grease bottom and sides of the pan with coconut oil*. 4. While the red layer is chilling, mix together box of blue Jell-O, 1 envelope of Knox gelatin, and 1-1/2 cups of hot water. Let it cool to room temperature. 5. Once the red layer has set, add 1/3 of the milk mixture to the pan, and let chill in the fridge for about 15 minutes, or until set. 6. As each layer sets, add a new layer, alternating between red, white, and blue. I added them in this order: red, white, blue, white, red, white, blue. This way one side of each square is blue, one side is red. Slice Jello in half lengthwise and use a star-shaped cookie cutter for stars and stripes all in one treat! or a bowl of red, white, and blue tortilla chips with your favorite salsa. Happy Fourth!!! To know me is to know that I love Trader Joe's. When I see its logo as I'm driving around the Bay Area, I smile fondly like I'm seeing a good friend. Sure, I have some complaints here and there. The fruit selection is limited, a lot of the produce is pre-packaged which creates more waste and makes it hard to check the freshness of what you are getting. And sometimes favorite items suffer a premature induction to Trader Joe's product heaven. But as a parent of kids with food allergies, I can forgive the store for all of this. I can because I have so much appreciation for the many safe and healthier choices Trader Joe's offers at a very reasonable price. From sunflower seed butter to soy yogurt, gluten-free cereals to dairy-free chocolates, they have a great selection of allergy-friendly foods. If I had to choose just one grocery store to shop at for the rest of my life, there is no question it would be one of the friendly, sticker-rich, sample-giving Trader Joe's in my area. 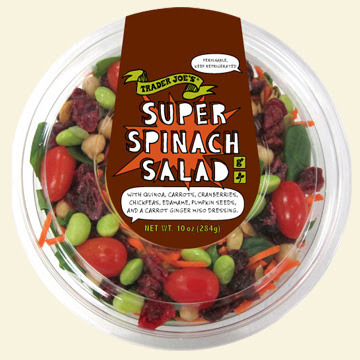 One of my latest Trader Joe's discoveries is their Super Spinach Salad. A mix of spinach, quinoa, tomatoes, dried cranberries,beans, and seeds, the salad is packed with vitamins, protein, and fiber. The carrot miso ginger dressing is just right in tying the tastes and colors together. It's great combination of salty and sweet, crunchy and chewy, and tart and tangy. It truly is a super salad. At $4 it's a great deal as a grab-and-go meal but I decided to recreate a bigger version of the salad for more bang for my buck. This can be a great addition to your 4th of July barbecues this week! The first time I made this I remembered incorrectly that the greens in the salad were kale leaves so I used that in place of the spinach. Not a bad substitution, especially since kale is such a nutritional powerhouse. Raw lacinato kale is a little harder to chew than I preferred, though. I have tried lettuce, too, and it works well as an alternative to the spinach and kale. Organic lacinato kale -- now at a Trader Joe's near you! I don't have a high-powered processor or blender so my dressing came out a bit coarse and thick. More like a "sauce" or gravy than a dressing. If you have a Vitamix or similar blender, use it to attain a smooth texture. The second time I made this dressing, to cut down on the fat I decided to forgo the extra tablespoons of vegetable oil and add a tablespoon of water instead. (Long story short, I've got a dress to fit into next month and not much wiggle room to play with!) Again, the texture was compromised a bit but the taste was still great. I didn't measure any of the salad ingredients. I made sure to have plenty of each ingredient on hand, added them into a bowl, and tossed and tweaked until I had a color combination I liked. I really love the quinoa in this salad. Like rice, it helps to capture all the competing flavors. One time I made this salad at the last minute and didn't have quinoa. It just wasn't the same! Kale in the GQ salad. Layer greens, quinoa, then carrots in a bowl. Add tomatoes on top. Generously sprinkle edamame, roasted pumpkin seeds, garbanzo beans, and dried cranberries on top. Toss with carrot miso ginger dressing or serve it on the side. Combine all ingredients except for vegetable oil in a blender or food processor. Blend until smooth. Blend in water a little at a time until your desired consistency is achieved. It's good to have extra ingredients around to adjust to your taste. prior to adding the other fixings to create a more uniform look. Eat your GQ salad alone this summer for a hearty meal or offer it as a side dish at a barbecue near you!